A day late, I know. Sorry. I may or may not have fallen asleep reading this next to my lil buds on the bed yesterday, thenceforth delaying the finishing and writing of this blog post. This book was amazing. 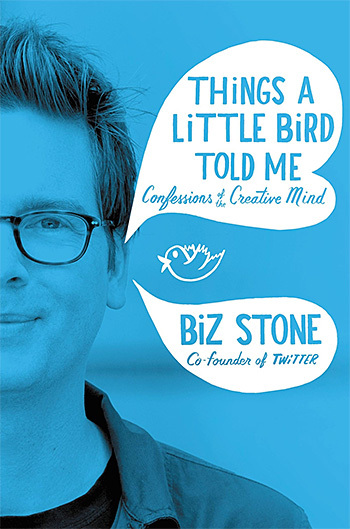 Things a Little Bird Told Me: Confessions of the Creative Mind by Biz Stone is the story of Biz and his journey from blogger to Blogger to Twitter and beyond. Quick caveat: you may or may not know that I am in the process of starting my own non-profit language institute, but being in the start-up phase myself, this book was AMAZING. I loved it. I want to make everyone on my board read it . . . in time. Biz shares his maxims for running and working for a business in such a personal and genuine way. This book is funny and lighthearted, but also deeply profound and extremely intuitive for a young entrepreneur . . . or corporate executive . . . or factory-line worker. When you hand good people possibility, they do great things. There’s no such thing as a superhero, but together we can spin the world in a new direction. Then there’s all of us, and together we are more powerful than any one thing. Can you imagine what we could get done? Global empathy is the triumph of humanity. I loved his emphasis on being and doing good before making a profit, and on making your goal to promote good rather than to just avoid evil. That being said, he also shares some really great business maxims: make your own opportunities; write your own rules; remember there are people smarter than you; assume the best; less graffiti walls, more food-line servers. The book is chock-full of funny anecdotes and moments of brilliance that Biz shares about his life, and you really see just how much of a human he is, and how he uses that to make great things happen and to go forward with big ideas and do his part to make the world a better place. Even if you couldn’t care less about Twitter, and totally avoid all social media, this book will make you think, smile, and probably laugh out loud. It will make you look for ways to invest in people, to look up every now and then from your own journey and find ways to step into someone else’s. And if you’re starting a business, let me highly recommend this book to you. I don’t think you’ll be sorry. Because my purpose is to provide a clear view of what readers can expect when they pick up a book, I will let you know that there are about two pages in this book that use swearing. Other than that, the only other criticism I can give is that I hold a different worldview than Biz, in that I don’t believe all humans are intrinsically good. But, I don’t think that is any reason to not read this book. Rather, it makes for a good conversation between the reader and Biz to hash out a few things about humanity. Bring some coffee.